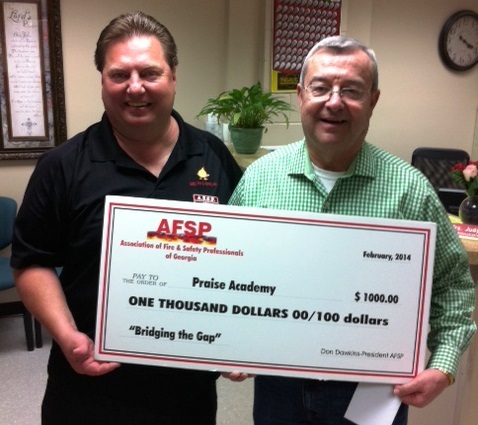 Left: Steve Polasky giving Joe White at Praise Academy a donation of $1,000.00, in 2014. Pictured Left to Right: Battalion Chief Donnie Griffis, Fire Chief David Eddins, Natalie Carter, Brittany Carter (Granddaughters of David Lee with ABC Fire Equipment Company) and Finance Director Danny Lamonte. Lt. Jeff Little past away at the age of 50 on Sunday, December 15, 2013 on duty while working a structure fire in Waycross, Georgia. 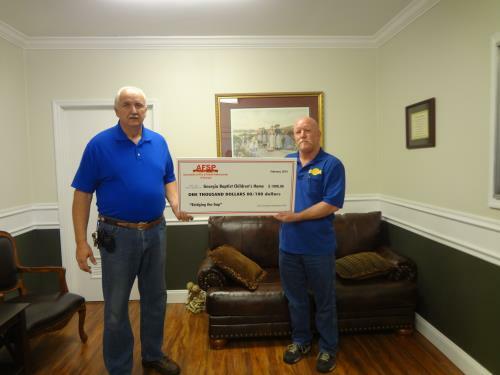 In honor of his name, the City of Waycross opened the Lt. Jeff Little Scholarship fund which offers college scholarships. 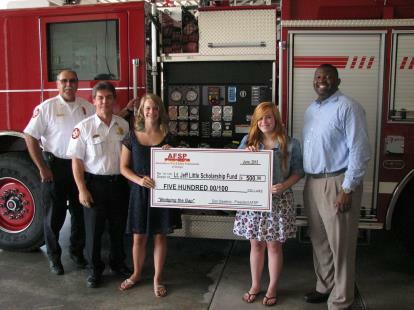 Association of Fire Safety Professionals (AFSP) donated $500.00 to this scholarship on June 4, 2015. 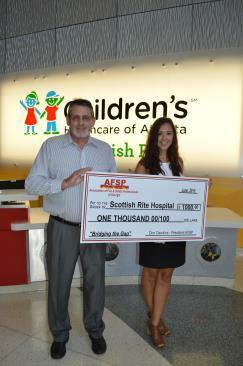 Children's Healthcare of Atlanta is a not-for-profit organization that provides specialized care to kids from all walks of life. Your donation helps ensure that they provide the best possible care to the little ones and their parents from today to the future. Generous contributions provided by the community to Children's Healthcare mission support their great needs from equipment and programs to training the next generation of caregivers. If you would like to donate to this cause, please contact Melisa Morrow, Development Officer at (404) 785-7338 or email at melisa.morrow@choa.org. 1577 Northeast Expressway, Suite A, Atlanta, GA 30329. Pictured Left to Right: Don Dawkins, Michele and Katrina. St. Jude Children's Hospital is leading the way the world understands, treats and defeats childhood cancer and other deadly diseases. St. Jude has the world's best survival rates for the most aggressive childhood cancers, and treatments invented at St. Jude have helped push the overall childhood cancer survival rate from 20% to 80% since they opened more than 50 years ago. 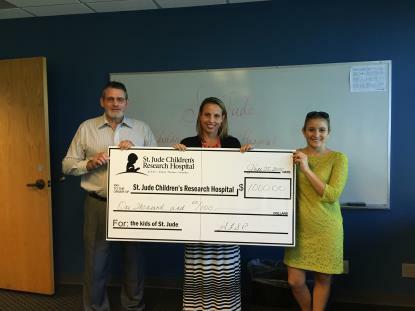 St. Jude is working to drive the overall survival rate for childhood cancer to 90% in the next decade. St. Jude freely shares the breakthroughs they make and every child saved at St. Jude means doctors and scientists worldwide can use that knowledge to save thousands more children. 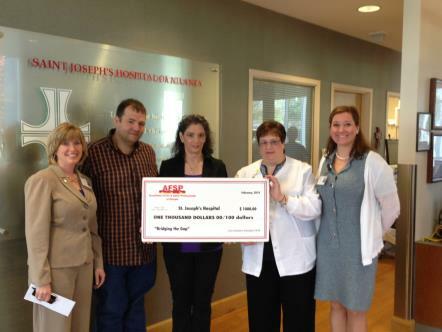 Families never receive a bill from St. Jude for treatment, travel, housing and food. Families should only worry about helping their child live. Join St. Jude mission by visiting stjude.org or following them on facebook.com/stjude and twitter.com/stjude. Pictured Left to Right: Millie Goble, Tina Goble, Corbin Douglas, Walton Douglas and Chaplain Dee Meadows. On February 17, 2013, Mattie Goble (at the time 5 years old) was diagnosed with DIPG (Diffuse Intrinsic Pontine Glioma), an inoperable, incurable brain stem tumor. On November 16, 2013 at 6 years old, she completed her very short journey here on Earth. 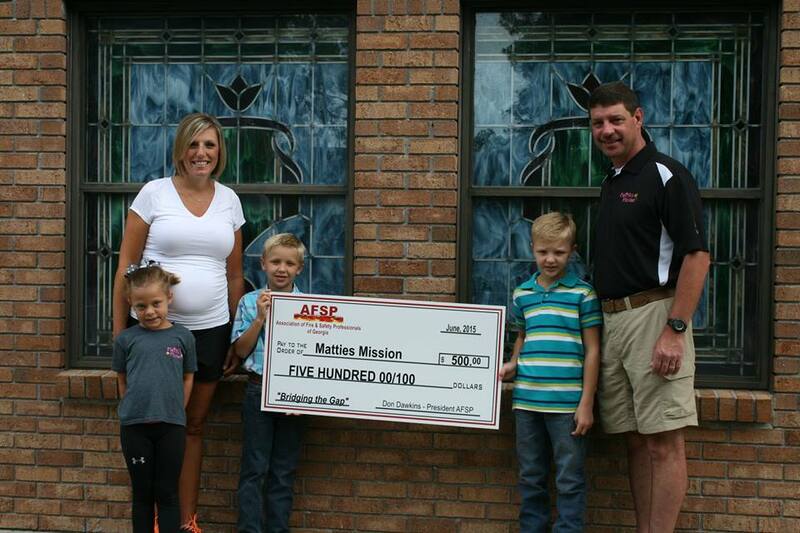 Mattie's Mission was created to help out families affected by childhood cancer. This Mission joins the fight against childhood cancer through research. The Mission makes a difference in many ways by holding fundraiser activities for research and provide financial services for families suffering from the effects of childhood cancer.